@Alex.Liu the webview issue is not related to Xamarin. This is by design in iOS 9. If you want a webview that loads insecure websites, you should switch to the new SFSafariViewController. Thanks for the reports. As a quick first attempt at reproducing this problem, I grabbed the HelloWorld_iPhone sample (also attached in a zip on this post in case you'd like to test it). Opening the .xib from that solution in Xcode Interface Builder did open 2 windows (I will file a little bug about that), but both windows worked correctly in my case. I closed the extra view for the .xib file, and switched back to the main project view. Then I navigated to the .xib file in the project browser in Xcode and selected it. The assistant was able to find the corresponding .m file, and the attributes inspector was able to find a new .png resource that I added to the project in Xamarin Studio. If either of you might have a test case that reproduces the problem you are seeing, please do zip it up and send it to [email protected]. Feel free to delete the bin, obj, Components, and packages folders before zipping it to save space. @BrendanZagaeski, @BobLautenbach. Thanks for the response. I am on my last day at a clients, it is their source code, so I am unable to ship you any examples, and any solution would be to late for the client, such are the pressures of being a commercial developer with a tight timescale. I have just noticed while following your post, that I double click on the xib and XCode loads as described earlier, If I close the view of the xib file and scroll through the Project Navigator, I can find the xib file. Opening it from here works perfectly. Images are present, and the Assistant Editor works too. 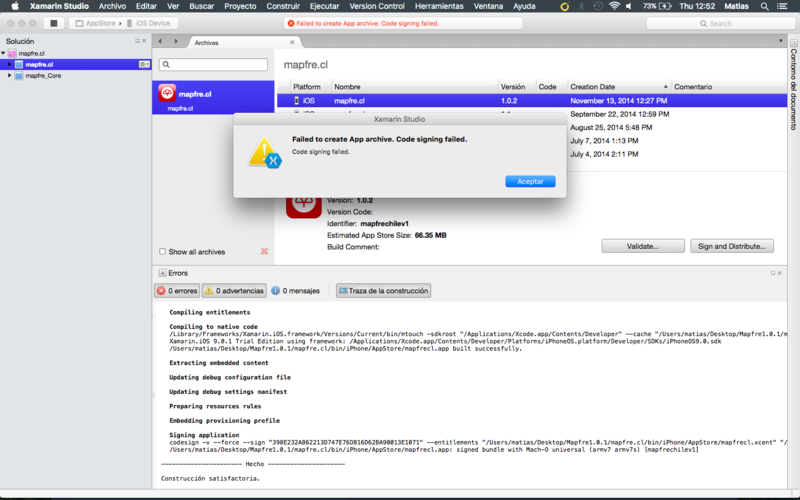 There is obviously an issue linking between Xamarin Studio and XCode. However this process is a useable work around for the time being. Thanks for your help. @BrendanZagaeski @JonathanDibble Thanks, this workaround helps. @StefanMoonen, for error ERROR ITMS-90035 (sealed resource) I was able to build a package that could be uploaded by using the Visual Studio build (after correcting alle app icons, still no tight integration in the project files it seems). Before I could not upload a build to Apple. (WF.Player.iOS)". I updated all tools (OS X, XCode) and switched to beta channel. Nothing helps. Searching for this error, I found an articel at Stackoverflow which suggest to use "--no-strict" when running codesign. But where could I insert this? Thanks for the report @DirkWeltz. If by chance you might have a test case you could easily share that demonstrates this problem, please do zip it up and email it to [email protected], and then leave a message in this thread to let me know. Feel free to delete the bin, obj, Components, and packages folders before zipping it to save space. If it is not easy to send a complete test case, then another way to start might be to zip up and send all of the .csproj files from your solution plus the Info.plist from your app project. Those files might contain enough clues to reproduce the problem. Thanks in advance! You could in theory copy the codesign command from the verbose build output, paste it into Terminal.app, and then add the --no-strict argument there. But building from Xamarin Studio should work, so the engineers would definitely be interested in a test case, if possible. @DirkWeltz I just ran into the "resource envelope is obsolete" issue and was able to fix it by doing a Clean and a Rebuild. @BrendanZagaeski: The tip from @Oran (clean and rebuild) worked for me too. Failed to create App archive. Code signing failed. @MarcelaMorales, if you haven't yet resolved this issue, either the "iOS 9 - Service Release 1" Stable channel versions or the "Cycle 6" Alpha channel versions will likely help. In Cycle 6, the "Archive for Publishing" and "Sign and Distribute" actions now use the MSBuild build logic by default. This change should resolve several problems with Classic API apps that affected Xamarin.iOS 9.0. In case it might be helpful, another temporary solution could be to downgrade Xcode to 6.4, downgrade Xamarin.iOS to 8.10, and downgrade Xamarin Studio to 5.9.6 (see also "Previous versions, downgrading" on the first post in the thread).